St Mang in Füssen, Bavaria, was a large and important Benedictine monastery. Traditionally founded by a local hermit, St Magnus, in the 9th century, it had a long and successful life until its secularization in 1803. At that time most of its library came to the University of Augsburg, but a number of printed books with the ownership inscription “Monasterii S. Magni in Füssen” can be found elsewhere. 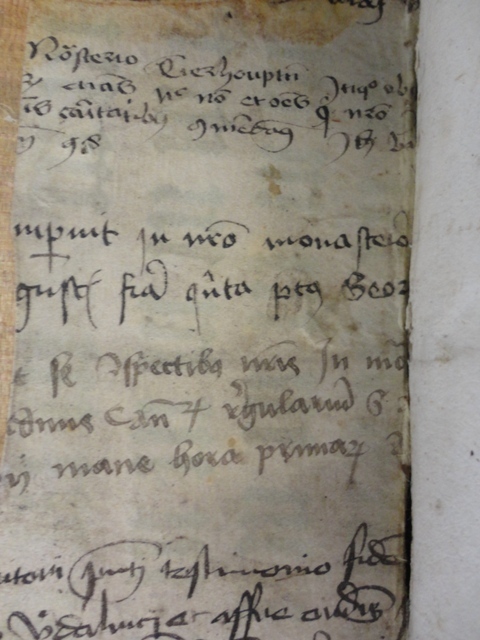 One of these, an edition of Michael Lochmaier and Paul Wann, Sermones de Sanctis (Heinrich Gran, Hagenau, 1516), eventually found a home in the Wellington City Libraries, Wellington, New Zealand, where it is now 093 LOC. Unfortunately we do not know how, when or why it came to the Antipodean capital. 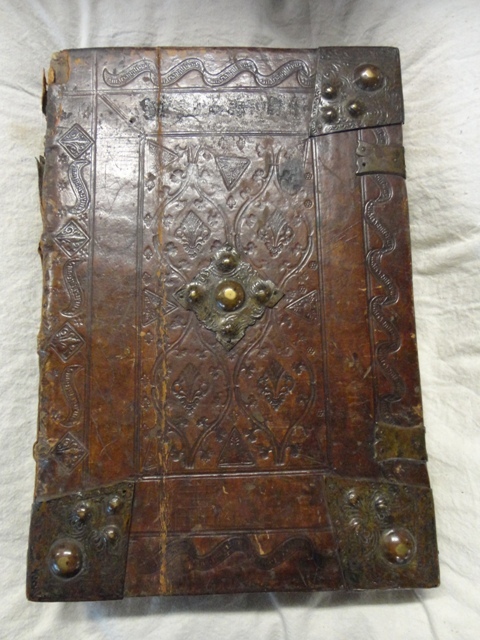 The book is still in its original binding of blind-tooled calf over wooden boards, sewn onto four supports, with central metal bosses on both boards, six out of the original eight corner pieces with half domes, and the remains of two clasps, closing on the upper board in the German fashion. The pastedowns are paper, and the back pastedown has lifted. 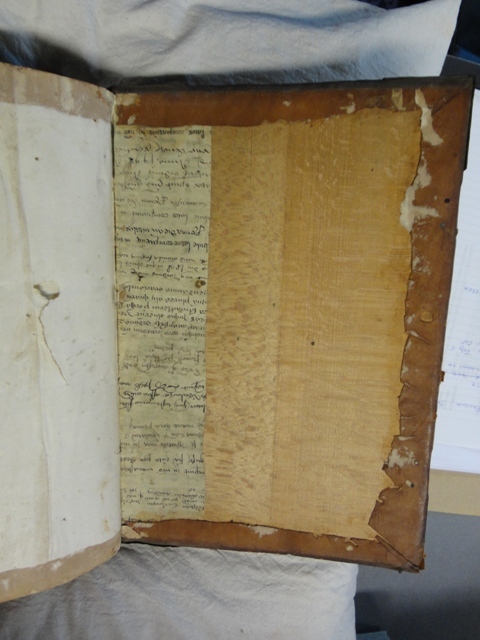 Underneath, glued to the wooden board and under the leather turn-ins, is a strip of a medieval document, written in a number of different hands. Further research has established that it is part of a fifteenth-century mortuary roll and that, so far as is known at present, it is the only such piece in New Zealand. It was the custom in the Middle Ages for religious houses to circulate information about the deaths of their members, together with requests for prayers, by means of parchment “mortuary rolls”. These rotuli or rotulae, wound around a wooden stick or rod, were carried from one monastery to another by laymen employed for the purpose. The host monasteries would record somewhere on the roll the fact of the bearer’s arrival on a particular date, promise their prayers, and include information about their own recent losses. New pieces of parchment would be added as required (some surviving rolls are five or six metres in length), and individual bearers’ journeys could take over a year. 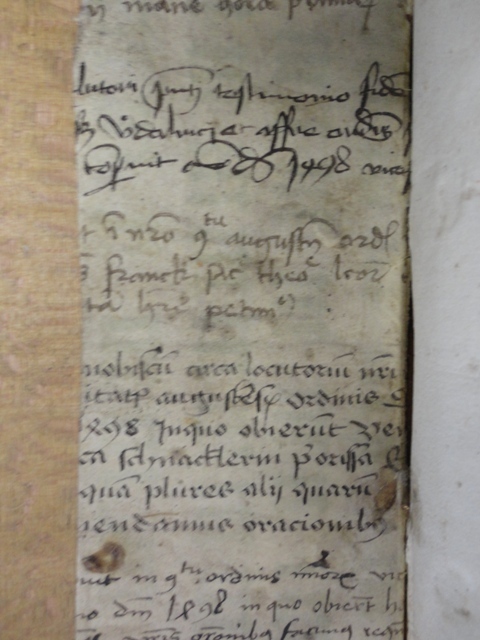 When the rolls eventually made their way back to their originating monasteries or convents, they provided in time a useful source of material for such humble duties as binding books, and it is not uncommon to find pieces of mortuary rolls among so-called “manuscript waste” in late medieval and early modern bindings. Our parchment strip contains 33 lines written in eleven different hands in various scripts. The date “1498” appears in several entries. The first surviving entry was made by the monastery of Thierhauptin (“Tierhouptin”), which contributed to the 1447/48 Admont Roll. 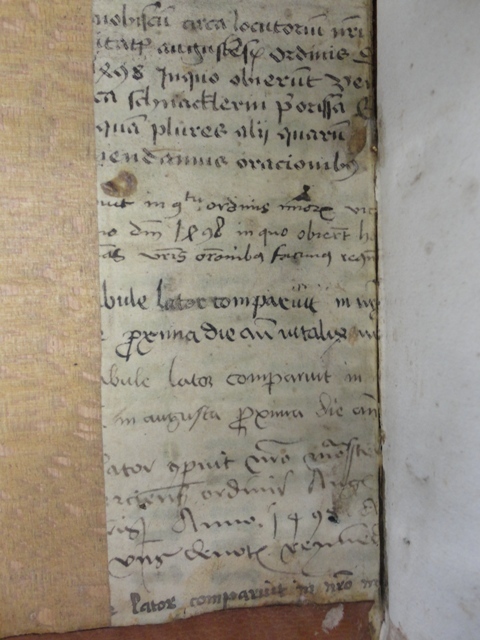 (The Admont Abbey Library, Austria, preserves a particularly good collection of intact late-fifteenth century mortuary rolls, to which St Mang in Füssen itself contributed in 1442, 1476/77, 1488/89 and 1494/96.) 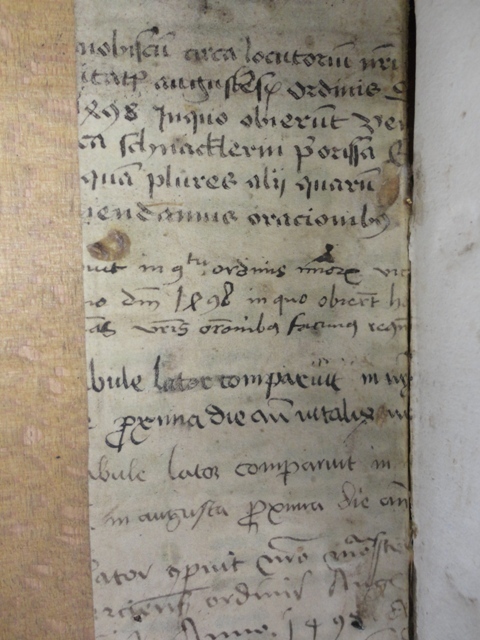 The fourth entry was made by the monastery of St Ulfrich and St Affra (“Vdalrici et Affre”), Augsburg, which contributed to the Admont Rolls of 1442, 1476/77, 1488/89 and 1494/96, and the sixth entry asks for prayers for Prioress Veronica Schnäcklerin (“Schnacklerin”) of the Benedictine monastery of St Nicholas, also in Augsburg, who is known from the Admont Roll of 1494/96. Although mortuary rolls covered extensive distances on their original journeys, this particular fragment must easily hold the record for globe-trotting! Images here are reproduced by kind permission of Wellington Public Libraries; thanks especially to Gábor Tóth for his assistance and to the Interloan staff at the University of Waikato for obtaining hard-to-get items. On mortuary rolls and their history, see N. Huyghebaert O.S.B., Les Documents Nécrologiques, Typologie des Sources du Moyen Âge Occidental, Fasc. 4 (Turnhout: Brepols, 1972), pp. 26-32, and Jean Dufour, ‘Les rouleaux des morts’, Codicologica 3 (1980), 96-102. Fritz Bünger, Admonter Totenroteln (1442-1496), Beiträge zur Geschichte des Alten Mönchtums und des Benediktinerordens 19 (Munster in Westfalen, Aschendorffschen, 1935), p. 37. Bünger, Admonter Totenroteln, pp. 29, 70, 168 and 232. Bünger, Admonter Totenroteln, pp. 37, 107, 116 and 176. Bünger, Admonter Totenroteln, p. 176. See also Gabriela Signori, “Totenrotel und andere Medien klösterlicher memoria im Austausch zwischen spätmittelalterlichen Frauenklöstern und -stiften,” in Eva Schlotheuber et al., eds, Nonnen, Kanonissen und Mystikerinnen (Göttingen, Vandenhoek & Ruprecht, 2008), pp. 281-96 (p. 287).